Sharing your travel adventures with others in a Trip Report is helpful in many ways. 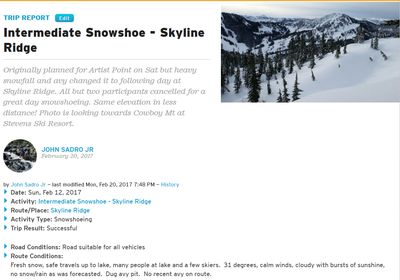 Trip reports can be a useful tool to share current trail conditions or noteworthy changes to a route/place, and they're a fun and creative way to share your unique experiences in the wilderness! Trip reports can be linked to an activity like a hike or a climb OR can be written by any logged in member or guest. Both trip reports will populate on the Route/place listing and in the main Trip Reports area. If you're a member and would like to post your own trip report, visit our Routes & Places and find a route you would like to comment on. Scroll to the bottom and click on the "Trip Reports" tab to leave your trip report. All trip reports are created as comments on Routes & Places. If you are a leader or participant on an activity and want to do a trip report connected to your activity simply find the activity under your My Activities area. Click on it and then click the blue Trip Reports tab. The best trip reports have photos and good detail about anything unusual on the trail or route. All photos can be added to the main Trip Report section using the little image of a tree to upload them. Confused about uploading photos to the rich text portion of the report? Learn more online here. Please include info about trail, route and waterway conditions, especially any hazards you may have encountered (or avoided) and anything that may be changing with the seasons or weather. Tell your story! Let us know about driving and parking conditions, campsite and permits, wildlife or rare plant sightings, weather, helpful gear and skills notes, and trip details like mileage, elevation gain, and round trip time. Viewing trip reports is simple. If you are on the homepage look for the selection on the left side called Recent Trip Reports. Or, from any other page on the site, go to the, "Explore" tab, you will find a link to, "View Trip Reports." Some people write a few sentences, and others write a few pages! No matter what, you're sure to find some useful information in there. If you want to find Trip Reports that you have created simply go to your My Profile page and look for the My Trip Reports tab. Insider's Tip: If you're looking for beta on a specific place, rather than just want to see what the most recent trip reports have been, you can do that easily by visiting our Routes & Places . There you can search for a specific place, or a specific activity if you're seeking a great hike for example, and view all of the recent trip reports by place. Unfortunately the comments portion of trip reports is not notifying leaders that someone has commented so if you have questions about the trip report please reach out to the member who posted it by email. Might be nice to have a suggested 'template' for a trip report, and a list of items that tends to be helpful for others to know about.